The research area of nuclear astrophysics is characterized by a need for information published in tens of journals in several fields and an extremely dilute distribution of researchers. For these reasons it is difficultfor researchers, especially students, to be adequately informed of the relevant published research. 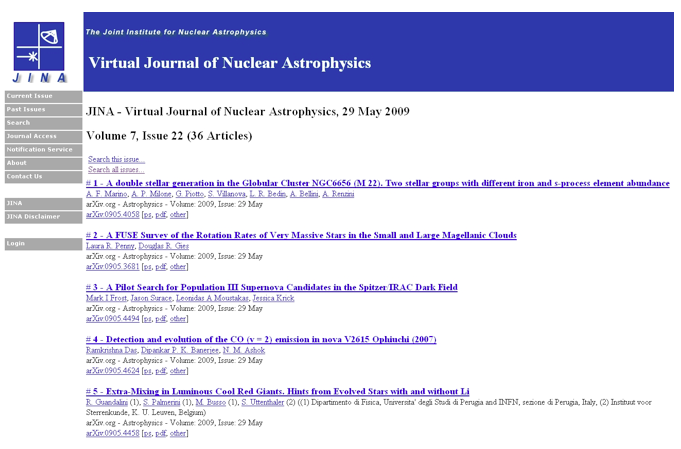 In an attempt to address this problem, we have developed a virtual journal (VJ), a process for collecting and distributing a weekly compendium of articles of interest to researchers in nuclear astrophysics. Subscribers are notified of each VJ issue using an email-list server or an RSS feed. The VJ data base is searchable by topics assigned by the editors, or by keywords. There are two related VJs: the Virtual Journal of Nuclear Astrophysics (JINA VJ), and the SEGUE Virtual Journal (SEGUE VJ). The VJs and support information are available here. Nuclear astrophysics is an interdisciplinary subject with contributions from many branches of physics and astrophysics. For example, someone studying the r-process that synthesizes half of the heavy elements needs familiarity with, for example, measurements of nuclear lifetimes and nuclear masses, shell model calculations of nuclear properties, models of supernova explosions, freeze-out processes, abundances in metal poor stars, atomic oscillator strengths, processes in stellar surfaces, and the implications of all these for nucleocosmochronology. It is, therefore, difficult for researchers in nuclear astrophysics, and especially for young researchers, to be cognizant of all the literature bearing on their research. This is aggravated by the dilute distribution of researchers, often only one in the field at a given institution. To remedy this problem, in 2003 we founded and have since been operating a Virtual Journal of Nuclear Astrophysics (JINA VJ). It is sponsored by JINA, the Joint Institute of Nuclear Astrophysics  at the National Superconducting Cyclotron Laboratory (NSCL) at Michigan State University. In 2006, we founded a similar journal for articles of particular interest to astronomical observers, the SEGUE Virtual Journal (SEGUE VJ) . Essentially all the technical description below applies to both of these virtual journals. More recently the JINA VJ has become an important source of data for the on-line JINA REACLIB database . We describe in Section 2 the evolution of procedures for generating the journal; in Section 3 the features and functions of the JINA VJ and some examples of its usage; and in Section 4 the extension of these procedures to the SEGUE VJ. 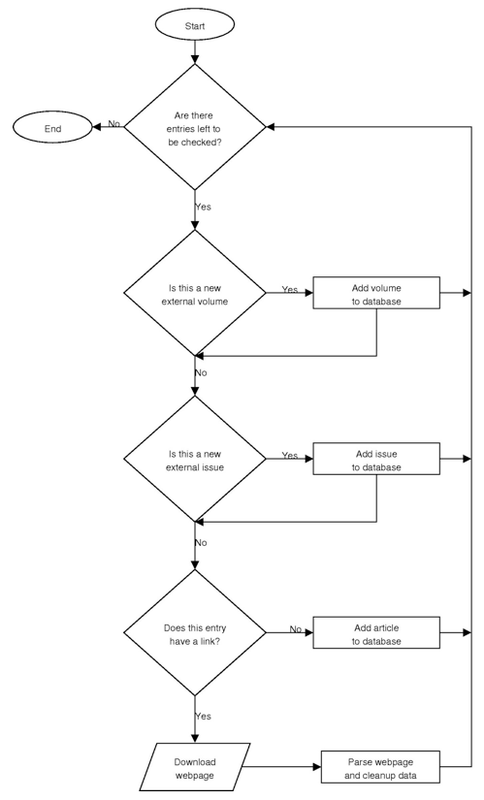 Figure 1: The article download process. To provide the desired coverage it was necessary to scan for appropriate articles in over forty journals, as shown in Table 1. It was found to be important to have two people with broadly different expertise perform redundant scans to ensure that the appropriate choices were made. Initially this process involved the following steps. An undergraduate student provided the Table of Contents (TOC's) of the chosen journals, including links to their on-line versions. Two editors, a nuclear physicist and an astronomer, scanned these lists. For each chosen paper, one or more categories were assigned, for example, "reaction rate", "r process", etc., to aid in searching by users. The categories for the JINA VJ are shown in Figure 3(a). An undergraduate student then compiled the chosen titles, links to them, and their assigned categories into a list that was entered into a searchable database maintained by the NSCL. Step (1) The production of the TOC's is now done semi-automatically. We attempted to make this process completely automatic, but continual structural changes in the journal TOC's made this untenable, and we have reverted to a less automated process. This is achieved with a suite of regular expressions for each journal. As journal TOC's change, these regular expressions can easily be updated. Figure 1 shows a schematic of the download process. After the weekly downloads, any error messages from problem downloads are examined and changes implemented. This takes about 30 minutes per week. Step (2) The lists are made available on a web-based PHP-driven  interface so they can be easily searched remotely by the editors; this takes about 60 minutes per editor per week. Step (3) The list of titles, links, and categories, is entered into a MySQL database , and a notification is sent to readers via "listserv" or "RSS". This takes about 10 minutes per week. An example of an issue of the JINA VJ is shown in Figure 2. The MySQL-based database developed specifically for the VJs provides flexible searches and integrates seamlessly with the REACLIB  database. This database provides recommended nuclear reaction rates to the community of modelers of processes in the cosmos, mostly in stars. More details about the virtual journal can be found here. Figure 2: Part of a page from the virtual journal. The first weekly issue of JINA VJ was published on July 18, 2003. A typical page is shown in Figure 2. There are normally 20-60 articles in a given issue and 1,500 to 2,000 articles in a given year; a total of 10,381 articles have been included through the December 2008 issues. The reader may click the appropriate link to see the abstracts or complete articles for those publications that make them publicly available without subscription. Of course, access to complete articles is, in many cases, available only if the reader's institution has an appropriate subscription. The individual journals contribute widely different numbers of articles, with the preprint servers having the largest contributions. To give an indication of the important journals for this field, Table 1 below notes the number of articles from each journal for 2008. Figure 3(a) shows the search page for the JINA VJ. 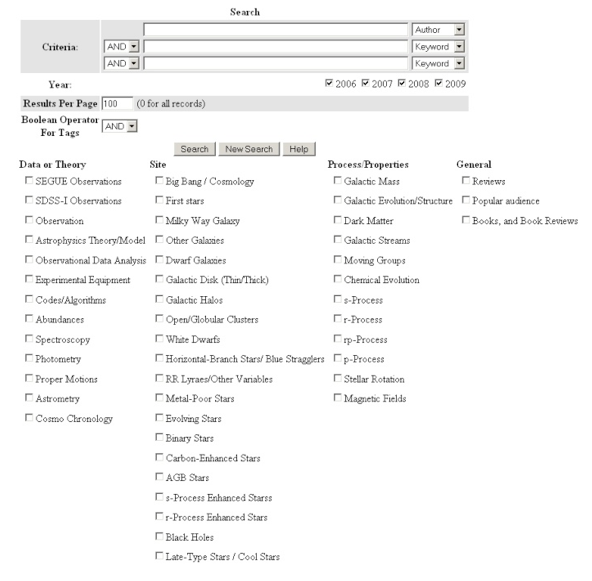 Checking any number of boxes and then performing a search presents a list of articles labeled by all of the box-items (an AND search) or any one of them (an OR search). In addition, text can be entered in the search boxes and ANDed or ORed with the other choices. Users can limit the search to a particular year or years. This capability allows an easy search of the literature. It has also proven useful for teaching classes in the field. For example, a choice of "Reviews" and "Core collapse SN" yields review articles on supernovae. A search on Woosley provides links to papers by S.E. Woosley. The usage of the JINA VJ is quantitatively evaluated in two ways. First, we keep track of the number of individuals who continue to receive our weekly list server notification. The list was initially populated by large mailing lists for the field of nuclear astrophysics; individuals can enlist or de-list easily. The total number notified has grown slowly. It is presently about 270; we find that few de-list, except for young researchers who leave the field. The second approach is through web-based hit and visit analyzers. Because of their contamination by commercial search firms and their robots, these data are very hard to interpret. Nonetheless, for the usual comparisons we typically find 30000/5000 hits/visits per month. A more reliable approach is through use of an engine such as Google Analytics , which is mainly insensitive to robot searches. The results since we have been using Analytics (April/2007 to May/2009) include 11,863 visits, and ~3 pages viewed per visit, compared to the group of ~270 individuals that receives weekly notifications. Analytics also provides geographical distribution statistics. Of the 11,863 visitors 6,640 are from the Americas, 4,390 from Europe, 736 from Asia, 84 from Oceana and 8 from Africa. The first ten countries, in order of visitors, are: United States, Germany, Italy, Brazil, United Kingdom, France, Canada, Hungary, Israel and Spain. The cities viewing the VJ over the last year are shown in Figure 4. The wide geographical distribution of viewers is a reflection of the access that the JINA VJ provides for the sparse distribution of researchers in less developed countries. Table 1: List of the journals scanned for the JINA VJ, the start date for which the specified journal was scanned and the number of articles from each journal that was chosen for inclusion in JINA VJ in 2008. Figure 3a: Search page from the JINA VJ. 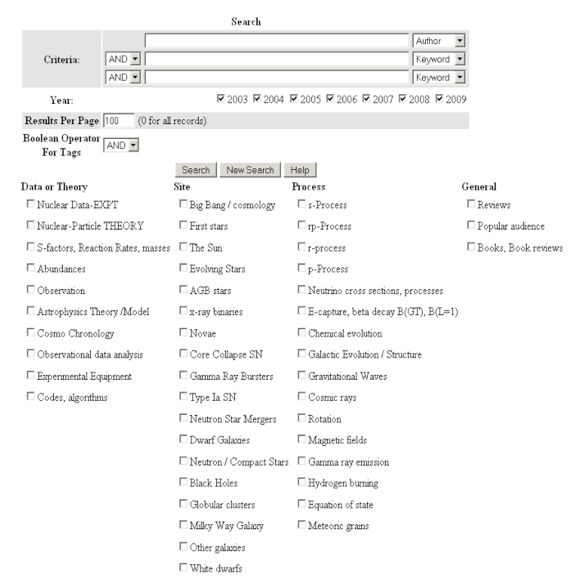 Figure 3a: Search page from the SEGUE VJ. During the evolution of JINA, astronomical observation came to play an increasingly important role. It appeared that this observational community would benefit from an additional virtual journal that would provide coverage for observers that was inappropriate for the more diverse clientele of the JINA VJ. The SEGUE VJ was formed to serve this need . The operation of the SEGUE VJ takes advantage of the procedures developed for JINA VJ. The categories for SEGUE VJ are shown in Figure 3(b). More details can be found here. Figure 4: This map shows the cities from which subscribers are viewing the JINA VJ website, as determined from Google Analytics  over the last year. We have developed an efficient set of procedures for producing Virtual Journals: summaries of titles and links to articles from a set of journals that are of interest to a particular research field. There are convenient search procedures for users, including choices of topics, key words, and authors. It is possible to link seamlessly to other databases that use material from the surveyed journals. The database structure, interface routines and other software requirements can be made available to those with an interest, though with limited support. We thank Jason Danielson for his assistance during the early development of the JINA VJ. This work is supported by the U.S. National Science Foundation Grants No. PHY-02-016783 and PHY-08-22648 (JINA). Richard H. Cyburt is Visiting Assistant Professor for the Joint Institute of Nuclear Astrophysics, working at the National Superconducting Cyclotron Laboratory at Michigan State University. He is Managing Editor of the JINA Virtual Journals and Project Manager for the REACLIB Database Project. His continuing research in nuclear and particle astrophysics maintains close ties between theory, experiment and observation; including Big Bang Cosmology and the origin of the chemical elements. Sam M. Austin is University Distinguished Professor of Physics at Michigan State University and is active in JINA, the Joint Institute for Nuclear Astrophysics. He is the Founding Editor of the JINA Virtual Journal, has been Director of the NSCL, Chair of the MSU Department of Physics, Chair of the APS Division of Nuclear Physics, Editor of Physical Review C, and is a Fellow of the APS and the AAAS. His present research is on helium burning processes in stars and on the influence of weak interactions in explosive stellar events. Timothy C. Beers is University Distinguished Professor of Astronomy at Michigan State University, and serves as an Associate Director of JINA. Prof. Beers is also Survey Scientist for the SEGUE-2 project, which is part of the second extension of the Sloan Digital Sky Survey. He is an expert in the discovery and analysis of the most metal-poor stars in the Galaxy, which provide critical information on the formation and evolution of the first generations of stars and on the assembly of the Milky Way galaxy. Alfredo Estrade is a graduate student at the National Superconducting Cyclotron Laboratory (NSCL). He was an Assistant Editor during the first two years of the JINA Virtual Journal. His current research is on experimental nuclear astrophysics with radioactive ion beams, with a focus on measurements of the masses of very unstable isotopes. Ryan M. Ferguson was an Assistant Editor for the JINA Virtual Journals while earning his Bachelor's degree in Physics and Astronomy at Michigan State University. He is currently an astrophysics graduate student at University of Colorado at Boulder. Alexander Sakharuk is Assistant Professor of Physics and Astronomy at Florida Gulf Coast University. His research field is theoretical nuclear physics. Hendrik Schatz is Professor at the Department of Physics and Astronomy and the National Superconducting Cyclotron Laboratory at Michigan State University. He is also Associate Director of the Joint Institute for Nuclear Astrophysics. He is a Fellow of the American Physical Society and a current member of the Department of Energy and National Science Foundation Nuclear Science Advisory Committee. His research interests are experimental and theoretical studies of nuclear processes with rare isotopes in astrophysical environments such as X-ray bursts, neutron stars, and supernovae. Karl Smith is a graduate student at Michigan State University, working at the National Superconducting Cyclotron Laboratory, and is active in JINA, the Joint Institute for Nuclear Astrophysics. He was an Assistant Editor maintaining the Virtual Journals' workflow. His present research focuses on experimental nuclear astrophysics relevant in explosive stellar events, such as supernovae and X-ray bursts. Scott Warren is currently a systems analyst for Midland Public Schools specializing in Mac Deployment and Help Desk operations. Before graduating from the Computer Engineering program at Michigan State University in the spring of 2009, he rebuilt and maintained the JINA Virtual Journals and the JINA Reaclib Database.